Buying a Wedding Dress? Browse through HUNDREDS of listings right now! and Formal Wear online through I Do Gowns!! I Do Gowns has the LARGEST, most diverse range of used, second hand or preloved wedding gowns, bridesmaids dresses, formal wear, flower girls and page boy wear, clothing accessories, mother of the bride wear and venue decorations for sale in Australia. I Do Gowns was created in 2004, and has since listed AND sold hundreds of wedding dresses to delighted buyers around Australia. We're committed to providing an outstanding service, at a great price. 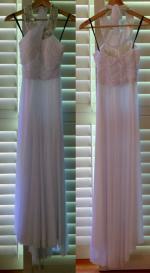 Please view our Price List to see how affordable it is to list your dress with us. SELLERS: It's simple. If you are in Australia, and have a secondhand wedding dress, formal dress or accessories etc that you would like to sell, follow our advertisement procedure here. You'll be able to sell that wedding dress (get yourself a treat with that spending money!) that's stored in a box under the bed AND help another bride-to-be look just as gorgeous on her wedding day as you did! Remember - we'll list your dress or item for as LONG AS IT TAKES TO SELL. No extra fees, charges or commissions. Just a once-only listing fee, and we'll keep it listed until you've sold it! BUYERS: To buy an item that's listed on this site, simply contact the seller directly, using the contact form provided with their listing. You can search our listings, by state or price! All of our sellers are genuine people (no stores selling old stock here!) who are waiting to hear from you today. RECENTLY SOLD ITEMS: We've just added the ability to view a list of items that have been sold through I Do Gowns. You can take a look at our recently sold items here! TESTIMONIALS: Below is the most recent selection of testimonials supplied by our happy sellers. You can also view all of our testimonials on one page here. Just to let you know I sold my wedding dress tonight to a lovely lady who loved it immediately, both on your site and in person! Thanks for your wonderful service; it really helped me to get the word out to the right market after 2 years of no success through the usual channels! I can’t believe more people don’t know about it - I’ll be sure to spread the word. 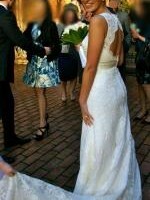 Your site helped me sell my wedding dress. You provided a professional and cost effective way to advertise and it sold for the asking price. I listed my wedding dress for sale in 2015 and my first enquiry resulted in a sale! Very pleased with result. My advice to sellers is to be patient and negotiate with your buyer. Thanks I Do Gowns! I have been trying to sell my wedding dress for 18 months. Finally had success through I Do Gowns. The notification from the site was comforting and that I felt it could be trusted....and was proven right! I decided to share this story as it is worthy of note. 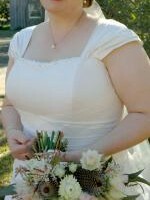 I was married in August 2014 and after about 4 months decided to put my dress and accessories onto the I DO Gowns website. Not for the money, simply in the hope that I could bring joy to someone who may not be as fortunate to be able to afford a special dress for their own Wedding Day. I had no expectations and then suddenly the joy came a couple of days ago, when out of the blue this wonderful lady made contact. From the broken English in the email message, I figured her first language was not English,nonetheless with no questions asked she was overjoyed to have found what she described was her best dress”. She paid immediately and within an hour I had packed up the dress and pondered over it for a short time remembering how much joy the dress had brought me on my special day. Now it was off to bring pleasure to another Wedding Day which was happiness in itself. The following day a follow up text came from the lady. Her joy at receiving the package and trying on the dress to find it fitted her perfectly was so very special. Her text read “because of you I have my best dress, size also perfect for me”. This is just one of many stories however what a wonderful way to bring joy to someone else’s special day. The personal reward is invaluable. Congratulations to the innovation behind this incredible website, I highly recommend it. Thanks I Do Gowns! After a lot of genuine interest and great exposure, my dress sold!!! 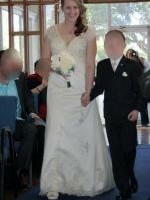 It took 12 months but given its a preloved wedding dress, that's understandable! Patience and persistence paid off!! Thanks so much!!!! I have a good experience with Idogowns.com.au. 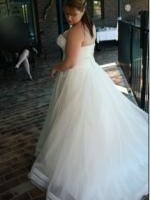 It was quick,simple and cheap to post my dress and the enquiries started coming in almost immediately. I sold my dress sooner than I thought. I love the feeling of knowing someone who really loves my dress will be giving it a second day in the limelight! Thank you for helping me sell my wedding dress. I came across your website by chance. I found the process of listing my dress very easy, and although it took a little while to sell, I am very happy with the outcome. The bride who purchased my gown was so grateful and lovely. I am thrilled to know that my dress will be able to create some wonderful memories for someone else. I will definitely recommend your site to others. Thank you for always being so prompt to send me enquiries and to follow up any changes I wanted to my ad. It has been a very easy process. I had multiple enquiries and my dress is now off for a second life in the ABC costume department! Worth a little wait to get the result. 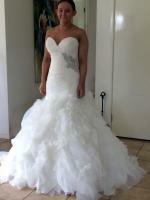 I sold my daughters wedding dress on I do gowns and found this website very easy to use. 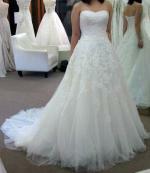 I would recommend this website for anyone wanting to sell there gown. It doesn't matter whether you're in Queensland, New South Wales, Victoria, South Australia, Northern Territory, Western Australia, Tasmania or the ACT - our listings are growing all the time, and your perfect wedding gown could be right here on our site!